Macfie & Co. is one of Scotland’s longest-established Property Management companies, with origins dating back to the firm of John Laing in 1840. The firm of John Macfie originated in Glasgow’s Gorbals in 1870 – they resided at 342 Crown Street for almost a century. Based in the South-Side of Glasgow, the company has a team of friendly and professional advisors, dedicated to providing advice on many aspects of Property Management, including Communal Factoring and Residential Letting, and for many styles of property, from tenement blocks to modern developments of new-build homes. We have been among the forerunners of our industry for many years, through longstanding involvement with the Property Managers Association (Scotland) Limited. We have played an active role in creating the template within which the modern Property Manager operates and the enhancement of working practices in adapting to general changes in the Law, Health & Safety requirements and the expectations of our clients. We strive to innovate in respect of the services we offer, in tandem with the ever-changing requirements of the job. 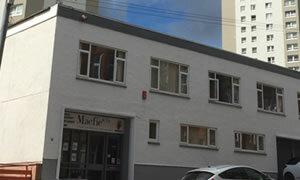 Macfie & Co is a member firm of the Property Managers Association (Scotland) Limited. We are registered with the Scottish Government as a Property Factor. Our firm’s reference is PF000098.